Team Maria is thrilled to announce that Sugoi, the leading manufacturer of high-performance apparel in endurance sports, has designed a custom cycling jersey for every member of our team. “We’re going to look awesome riding together along highway one,” said Tamara Torlakson, member of Team Maria. Sugoi is not only the official apparel of Cannondale Pro Cycling, but also for the 4 Best Buddies Challenge events across the country. Cannondale has stepped up also as the official bike sponsor of the Best Buddies Challenge and will have a new rental fleet of over 150 bikes on the road this weekend. A few weeks ago Torlakson and fellow team member Justin Knighten went on a training ride in San Francisco to prepare for the upcoming Challenge. Thanks to Sugoi, the twosome also had the pleasure of testing out the company’s top cycling apparel. Check out the photos below from their ride. “I’m a runner so I spend a lot of time in athletic clothing. I know the difference between what feels good and makes you better and what doesn’t,” said Torlakson. “While wearing the Sugoi apparel, I felt like a superstar Tour de California cyclist.” Team Maria is in for a treat. New cyclists will enjoy Sugoi’s clothing – the attire is comfortable, cool and easy to wear. You will look and feel great. Advanced cyclists will appreciate the clothing for many of the same reasons, especially for those completing 60 or even 100 miles. 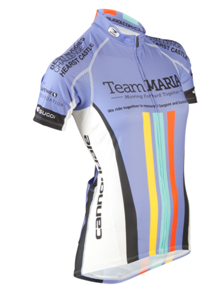 The jersey highlights the fantastic companies that power Team Maria and the friends and family that continue to raise support and awareness for Best Buddies. Thank you Sugoi and Cannondale for all that you do to power Team Maria and Best Buddies!! The countdown! In just a few short days, we will embark on the 11th annual Best Buddies Challenge: Hearst Castle in style. Together, we will ride to take-in the majestic coastline and crisp clean air. We will ride with our friends and family. We will ride, walk and run to support people with intellectual and developmental disabilities (IDD). “We all know the pain of feeling like we don’t belong. And we all know the desire of wanting to feel part of the group,” said Torlakson. “As an athlete I know this all too well. A team is a safe haven for support, motivation and friendship. That’s why I’m on Team Maria. We are living proof of the power of a team and the Best Buddies mission!” With our fabulous and fearless captain Maria Shriver as our guide, Team Maria will once again ride in an effort to help Best Buddies change lives and empower people with IDD. So, get ready California and clear the way for our posse in purple.